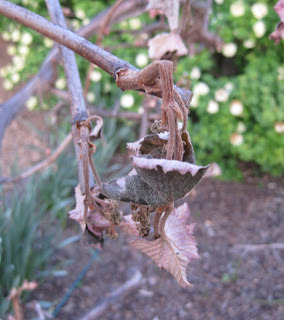 Grape leaves after two nights of frost. When March didn't act like March and instead put on a darn good impersonation of May, we were all giddy and happy and clapped our hands together to show our approval. But in the back of our minds we knew. We knew we should not have approved of March's May. We should have told March to act its month. We knew it wouldn't last. We knew that April wasn't as talented or as well-behaved as March and it would only be, could only be April. April means frosts, possibly freezes. Who or what got caught in the middle when those cold temperatures returned? Overall damage in my garden is not as bad as I suppose it could be, or as bad as it was in April 2007. The grape leaves are crunchy. Grape vines are pretty sturdy plants, resilient, and tough. I expect it will grow some new leaves. Other plants like lilies that sprouted too soon, a few other flowering bulbs, and the tips of roses look a little droopy, but I expect they'll come out of it. The beautyberry shrubs (Callicarpa sp.) have crispy leaves like the grape vine. I'll cut them back to the ground and they'll renew themselves with new growth. I was going to do that anyway but the green growth looked so green and fresh. Now that it is brown and crispy, I'll have no regrets whacking them back. A few other plants, including Endless Summer hydrangeas and a small ground cover type plant with blue flowers that I can never remember the name of and am too lazy to go look up, suffered quite a bit of damage. We'll see what they do. All in all, April, behaving normally, had a tough act to follow. It's like that younger sibling who is always being asked why can't they be better like their older sibling who seemed to be taller, prettier, more talented. Ah, well, it can't. It can only be April. It can only act its month. I've accepted that and am moving on because we are almost to the perfect month of the year... May. Then we won't care about March and April. May will make it all better. When May acts its month, we'll all be happy. TS Eliot -- April is the cruelest month...especially for gardeners. Well said, Carol. Smarten up, year! My Endless Summer Hydrangeas are fine on the north side of the house but the Let's Dance Hydrangeas took a beating, leaves crispy and curles, some knockout roses also have bent stems. I hope May does make it all up to you...the peacekeeper sibling. March, indeed, was weird. But after the 16+ days of 90 degree temps last summer when I didn't get into the garden at alll, I managed to redeem the garden into some type of 'neat'. Let's hope for a mild, wet summer. So far April here has been chilly enough to prolong the ridiculously early March blooms, but not so frosty as to kill them. But she has been unusual in being totally dry - I've actually had to water! We'll see how she behaves in the coming weeks... What a wacky year. Ouch frost? That is a kick in the bulbs. I'm keeping my fingers crossed....Sunday is median last frost day here. This year it was March 7th or so. The weather has been crazy here too-everything is out of wack. Everything is blooming early and no April showers! I wonder what the rest of the season will bring. I'm glad April's temperatures so far have been more normal, but we definitely need more rain. Mother nature did help us out somewhat here since the trees leafed out earlier. There was frost in our neighbors' sunnier yards this week, but none here (yet) thanks to our leafy microclimate. I am so disoriented - looking around me I see plants that shouldn't be blooming until May but it is April - I felt that same way (living near the snowbelt in upstate New York) all winter when there wasn't snow on the ground.